You may have noticed I have a new tab called “Prints.” After a few months of looking at websites for selling photos, and obsessing over printing companies, I finally took the plunge and signed up with Society6 to sell some of my photos. I was going to use etsy.com, but wanted someone else to do the packaging and shipping, something I really hate doing. If this doesn’t work out, I’ll try etsy. I also like that Society6 offers framed prints, stretched canvases and iPhone or laptop skins. Not all my photos will work for everything, but it’s a fun thing to see my work on the back of an iPhone. It hadn’t even occurred to me to put an image on the back of my laptop. Oh, if there’s a photo that you’d like to order, but it’s not on the society6 site, just send me an email and I’ll see if I can upload it. When I was a little girl, one of my favorite activities was to cut out photos and paste them in a “book” that was held together with brass fasteners. I never dreamed I’d be doing that with my own photos one day. When I started blogging, I did it for fun. Then some readers asked about purchasing prints and I honestly didn’t know what to say. It just hadn’t occurred to me. Eventually I decided to research the idea and that led me to Society6. But enough on that. 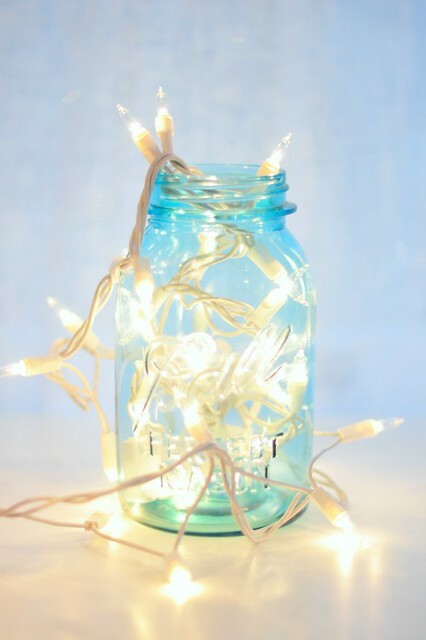 Here’s a fun project with my favorite vintage Ball jar and some white Christmas lights. . . .
Would love to know which one you prefer. . . . 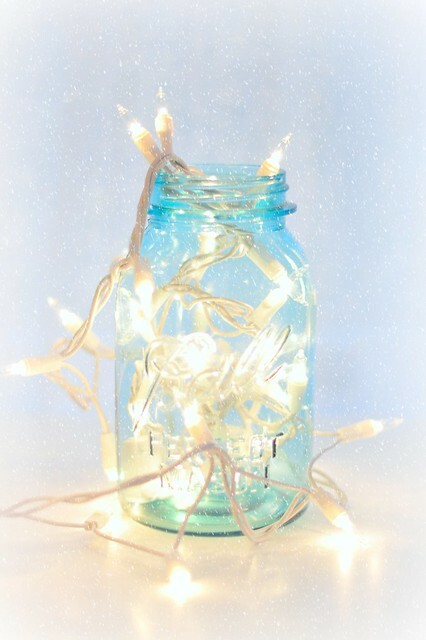 This entry was posted in photography and tagged Ball jar with Christmas lights, society6. Bookmark the permalink. I think we’re having a brown Christmas too, Jeanne. I like snow on Christmas, but we had so much last year, I’m tired of it. I like it without the snow — it’s already intricate, and for my money the snow adds unnecessary detail. Best wishes on your Society 6 venture; it’s about time the world got the opportunity to have some of your artistry as their very own! Your work is so-o-o good . . . I hope Society6 works for you! I like your jar. Years ago I made jars like that for my family. Except I stuffed them with Christmas lights and potpourri. Thanks, Thoughtsy! I like the potpourri idea. I think I like the one without the snow better but I must admit, since you have the snow on your page, I’m a bit distracted. Actually, no, I looked again, I now I know what it is. Look at your website and compare the wordpress snowflaes with the onses on the photo… I think they should be a little bit bigger but with more space. I agree about the fake snow, but they don’t give you many options, unfortunately. Cool. The other people I’ve polled are evenly split. Hmm. I think I like without the snow a little better. Maybe I like the crispness of the colors. Good luck on the Society6 site. I’ve never heard of it, so I’ll pop over to check it out. Thanks, Jackie. I had never heard of it either. Good luck with selling your prints! I like the first one, but both are beautiful. What an absolutely great idea! I definitely think you should be selling your photos. Now for the two images, I think I might prefer without the snow.